Caption: “(Director Hirokazu Kore'eda), winner of the Cannes Film Festival Palme d'Or.” Screencap from GAGA (distributor and promoter of ‘Shoplifters’) official YouTube channel. 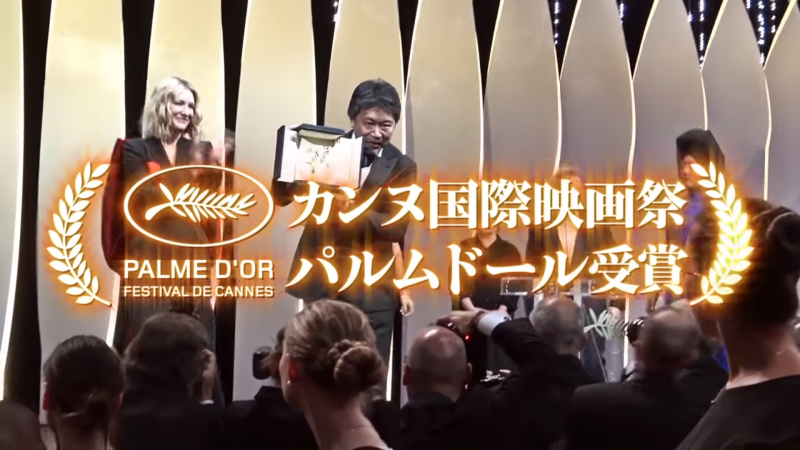 In May, Japanese director Hirokazu Kore'eda became the first Japanese director to win a Palme d'Or at the Cannes Film Festival in 21 years. This was the sixth time Kore'eda had been nominated for an award at Cannes; the Japanese director had won the Cannes Jury Prize in 2013 for his movie ‘Like Father, Like Son’. The Cannes Festival is an annual film festival held in Cannes, France, on the French Riveria. Widely considered to be the most prestigious film festival in the world, Cannes features just a small, exclusive list of films each year for competition. The festival has launched the careers of many influential filmmakers, with past winners of the Palme d'Or including ‘The Piano’ by Jane Campion, ‘Pulp Fiction’ by Quentin Tarantino and ‘The Third Man’ by Carol Reed. The last Japanese director to win the Palme d'Or was the Japanese New Wave‘s Shohei Imamura, for his film The Eel. This year, Kore'eda won the Palme d'Or for his film ‘Shoplifters’. The movie, which Kore'eda says is based on real events, stars frequent Kore'eda collaborators Lily Franky and Kirin Kiki and tells the story of a family of shoplifters living on the poverty line, struggling to get by in Tokyo. Some suggest ‘Shoplifters’ is intended to be a commentary on an economically struggling Japan that has seen economic disparity increase over the past two decades, as wages have stagnated. Isn't it a global embarrassment that a Japanese person has won an award for making a film about a family of Japanese shoplifters? Just one more example of a nation on the decline. A film is not a vehicle to accuse, or to relay a specific message. If we reduce a film to this, we lose all hope for cinema to ignite a richer conversation. I have never made a film to praise or to criticize something. That kind of filmmaking is nothing but propaganda. Reflecting on the past where the film industry became united with ‘national interest’ and ‘national policy,’ I tend to think that keeping a clear distance from government authority is the right thing to do. Since 1991, Hirokazu Kore'eda has made 18 films and television documentaries. Nearly all of them use a realistic style to explore the human experience, often in the context of family. Watching the film, which has little dialogue and many lingering shots of the Japanese landscape, one has an uncanny sense of entering the consciousness of the main character and seeing through her eyes, all without really knowing her. The indoor ‘tatami shots‘ Kore'eda employs as a director in this film, combined with his focus on character and family life have led to comparisons with director Yasujiro Ozu. In this 1998 film, the recently deceased get into heaven by selecting their happiest memory — remembering this happy moment will be how they spend eternity. Those who cannot decide on a memory are instead employed as bureaucrats, counseling the newly dead while they remember the past. While writing the script for ‘After Life’, Kore'eda Hirokazu actually interviewed 500 people, asking them to choose one memory they would want to remember for the rest of time. Kore-eda, with this film and the 1997 masterpiece ‘Maborosi,’ has earned the right to be considered with Kurosawa, Bergman and other great humanists of the cinema. His films embrace the mystery of life, and encourage us to think about why we are here, and what makes us truly happy. Based on true events, ‘Nobody Knows’ tells the story of four children abandoned by their mother — with a father nowhere to be seen — in a Tokyo apartment. With parents and adults absent,the children recreate their own family as they struggle to survive, with the film demonstrating how social bonds have been severed in contemporary Japan. With its low, interior shots and scenes of family life, the 2008 ‘Still Walking‘ has also led to comparisons with Ozu. Set over the course of a weekend as a family gathers to commemorate a death, ‘Still Walking’ examines how families communicate — or choose not to. To learn more about Hirokazu Kore'eda's films, the British Film Institute (BFI) has an excellent starter guide.